Social sharing widgets are very important for increasing your blog/site ranking. Your blog visitors are much important for you and you don,t have to leave your visitors without any facility. You have to encourage your visitors by giving them many type of important things. Mashable style social sharing widget is a very important to save your visitors on your blog. It has many social sharing sites like Facebook & twitter. It also has a beautiful subscription box and a google plus recommend button. After adding this widget to your blog, you will see that your blog is much comprehensive for your visitors and also for you. 1. Login to Blogger >> Layout & click on Add a Gadget. 3. Paste the below code inside it. ★ Replace HamzaNetwork with your Facebook username. ★ Replace HamzaFarooq7 with your Twitter usename. 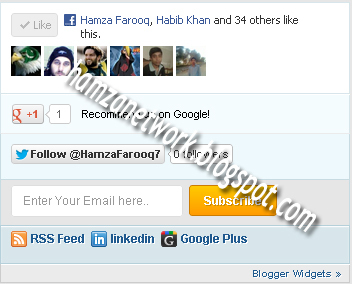 ★ Replace http://feeds.feedburner.com/HamzaNetwork1 with your Feedburner link. ★ Replace LINKEDIN PROFILE LINK with your Linkedin profilelink. ★ Replace https://plus.google.com/115812869135192839984/posts with your Google plus profile link. ★ Click on save and you have done everything. your cool widget will look onto your blog. Give your comments for this beautifull widget.